There are an increasing number of publications concerned with the work of Wilfred Bion (1897-1979). Many have sought new ideas from his writing however, little attention has been paid to the intellectual context in which Bion wrote. 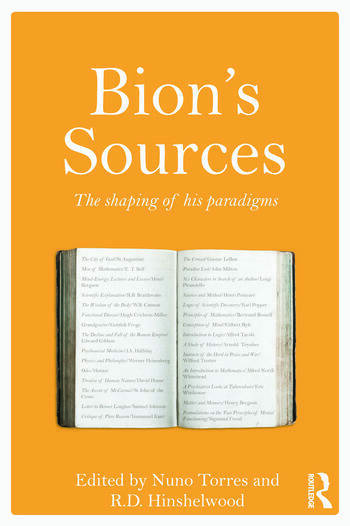 Bion’s Sources traces where Bion’s new ideas came from, what job he required of them, how successfully he used his context and how that has fertilised psychoanalysis. Expert contributors provide chapters on areas of the intellectual context separate from or adjacent to clinical psychoanalysis in Britain which have clearly influenced the texts Bion left (those published in his life time, or subsequently). Chapters explore the influences deriving from Wilfred Trotter, Henri Bergson and process philosophy, Kurt Lewin and group dynamics, Immanuel Kant, R. B. Braithwaite and the philosophy of science, the mathematics of notation and transformation, as well as the work of psychoanalysts who have applied their theories to social science, psychosomatics, and literature and the humanities. By contextualising Bion in the wider culture of ideas, and removing him from the exclusive world of Psychoanalysis, Bion’s Sources aims to moderate his ‘genius’ by showing how it was shaped by very wide influences. This book will be of interest to psychoanalysts, clinicians and those interested in the history of psychoanalytic ideas. Aguayo, Foreword. Preface. Biographies of authors. Torres, Hinshelwood, Introduction. Torres, Gregariousness and the Mind: Bion and Trotter. An Update. Torres, Intuition and Ultimate Reality in Psychoanalysis: Bion’s Implicit use of Bergson and Whitehead’s Notions.Torres, Hinshelwood,The Wider Medical Culture of Bion’s Bio-Psycho-Social Framework. Hinshelwood, The Tavistock Years.Torres, Bion’s Concept of Proto-Mental and Bergson’s Views on Matter and Mind. Torres, The Psycho-Social Field Dynamics: Kurt Lewin and Bion. Pines, Hinshelwood,Bion’s Analysts. Vonofakos, Hinshelwood, Letters to John Rickman: Transition 1939-1951.Wieland, Freud’s Influence on Bion’s Thought – Links and Transformations. Noel-Smith, Thoughts; Thinking; and the Thinker: Bion’s Philosophical Encounter with Kant. Harris, Redway-Harris, Braithwaite and the Philosophy of Science. Massicotte.Notation, Invariants and Mathematical Models. ffytche, Bion's Aesthetic Turn. Hinshelwood, Torres, Conclusion. Index. Nuno Torres is a clinical psychologist, researcher and lecturer at ISPA-IU in Lisbon, Portugal. He is a fellow of the Research Training Program of the International Psychoanalytic Association, a member of the Society for Psychotherapy Research and a Visiting Fellow of the Centre for Psychoanalytic Studies at the University of Essex. R.D. Hinshelwood is Professor in the Centre for Psychoanalytic Studies, University of Essex. He is a Fellow of the British Psychoanalytical Society, and a Fellow of the Royal College of Psychiatrists. He has authored numerous books and articles. Observing Organisations (2000) was edited with Wilhelm Skogstad and is among a number of texts he has written on psychoanalytic applications to social science.